Rising star Simon Thomas. What’s so special? His company is refurbishing the London landmark Hippodrome. “There aren’t enough characters in gaming anymore. The market is totally divided up among the dull big corporates,” says Simon Thomas. He says it would be nice to see smaller, more innovative firms in the casino and gaming markets. 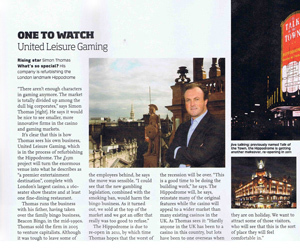 It’s clear that this is how Thomas sees his own business, United Leisure Gaming, which is in the process of refurbishing the Hippodrome. The £15m project will turn the enormous venue into what he describes as “a premier entertainment destination”, complete with London’s largest casino, a 160-seater show theatre and at least one fine-dining restaurant.